Debate continues over the merits of putting a price on carbon emissions — with many businesses opposing such a move. However, an increasing number of companies are adopting carbon pricing, according to a report released in September by CDP (formerly the Carbon Disclosure Project), London, a not-for-profit organization backed by institutional investors and others. The publication notes that carbon pricing already has spurred some firms to reallocate investments. Called “Embedding a Carbon Price into Business Strategy,” the report summarizes the disclosures of companies around the world that responded to CDP’s 2016 climate-change and supply-chain information requests. A total of 1,249 firms revealed that they already price carbon emissions (517 companies) or plan to do so by 2018 (732). This represents a 26% increase in the number of companies disclosing a price on carbon compared to 2015, says CDP. The utility and energy sectors had the highest proportion of companies that price carbon or intend to, 63% and 52%, respectively. “147 companies are taking this approach further, by embedding a carbon price deeper within business strategies and operations. They have identified it as a mechanism that can help systematically achieve emissions reductions and related targets. Companies report that an internal price helps by providing an incentive or added reason to reallocate resources toward low-carbon activities; as a factor in the business case for R&D investments; and as a way to reveal hidden risks and opportunities in a company’s operations and in its supply chains,” declares the report. “37 companies have disclosed a tangible impact as a result of internalizing a cost on carbon. They describe a variety of ways in which this tool has directly shifted investments toward energy efficiency measures, low-carbon initiatives, energy purchases, and the development of low-carbon product offerings” it adds. “This year’s reported increase is prevalent in all regions. Notable increases were from companies headquartered in Brazil, China, India, Japan, Mexico, the Republic of Korea and the U.S.,” states the report. The number of U.S. firms jumped by 43% from 2015 to 2016, from 147 to 210. Only 30% of companies that set a price disclosed it. In areas with a regulatory framework such as Canada and South Korea, firms generally followed pricing policy signaled by regulation. Elsewhere, though, pricing varied dramatically — from <$1/mt to >$800/mt. However, far more responding companies (3,234) stated they don’t price carbon and don’t intend to do so. More than 500 of these firms are in high-emitting industries and thus face potential regulatory risks, warns CDP. About 400 are headquartered in countries that already have or are planning or contemplating a price on carbon. Companies based elsewhere likely will have to contend with such carbon pricing given the multinational nature of their businesses, comments CDP. For a copy of the report, go to: https://goo.gl/uLDaLW. The attention given to global environmental issues such as greenhouse-gas emissions and water availability only will increase. 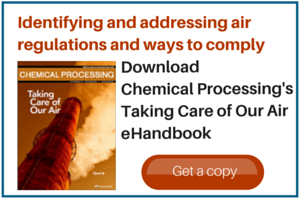 Many chemical companies must become more proactive in tackling them. Mark Rosenzweig is Chemical Processing's Editor in Chief. You can email him at mrosenzweig@putman.net.